During the week, I work a typical 9 to 5 office job. When I am at work, it can become difficult to prepare a meal between meetings and projects. Since that is the case, I do my best to fit in healthy snacks as often as possible. 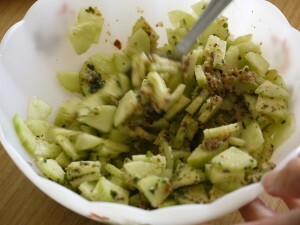 One of my favorite raw foods to snack on is cucumber. I was searching the web for cucumber recipes to spice things up. I came across thefoodcharlatan.com, which had just what I was looking for. This Cilantro-Lime Cucumber Salad was perfect and delicious. Once I fell in love with it, I could not wait to share it with my readers.